I'm slowly slowly getting my sewjo back, despite the best effort of both my machine and overlocker to thwart me at every turn. Tilly and the Button's "Coco dress" is the next item on my hit list. I bought this pattern as soon as it was released and then sat on it for ages. I'm not exactly sure why. I kept seeing great versions on the Internet...along with some not so great (to my eye) versions every now and then. So, of course I thought I was going to make a wadder, and not a great version, so I just never made it at all. Now that the weather has turned cold, and I've sort of run out of things I feel like sewing I thought it was high time to turn my attention to Coco. 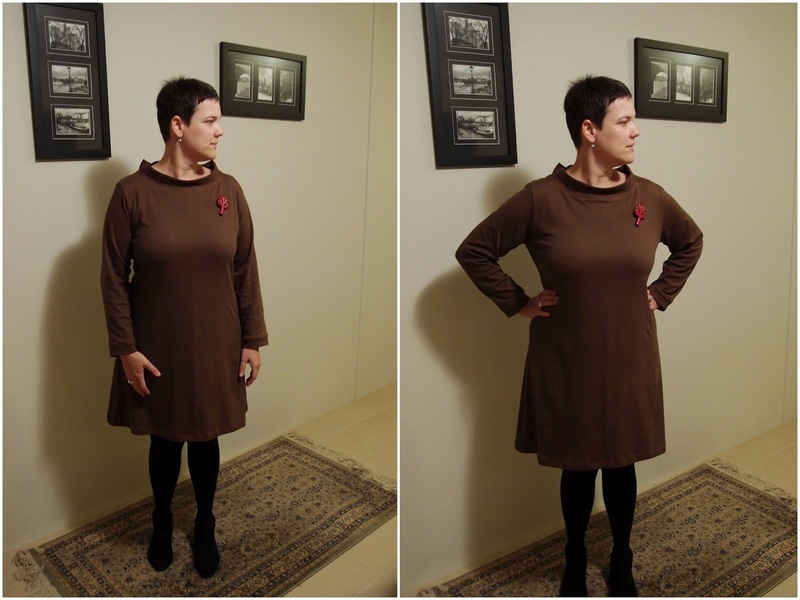 For this stunt dress I've used a fabric bought from The Remnant Warehouse back in March. 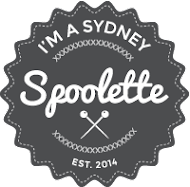 I was specifically on the hunt for some printed ponti for Coco (which is impossible to find in Sydney) but at the time this "mystery fabric" was all I could find. It looks and feels a bit like the material a man's polo shirt is made out of it. 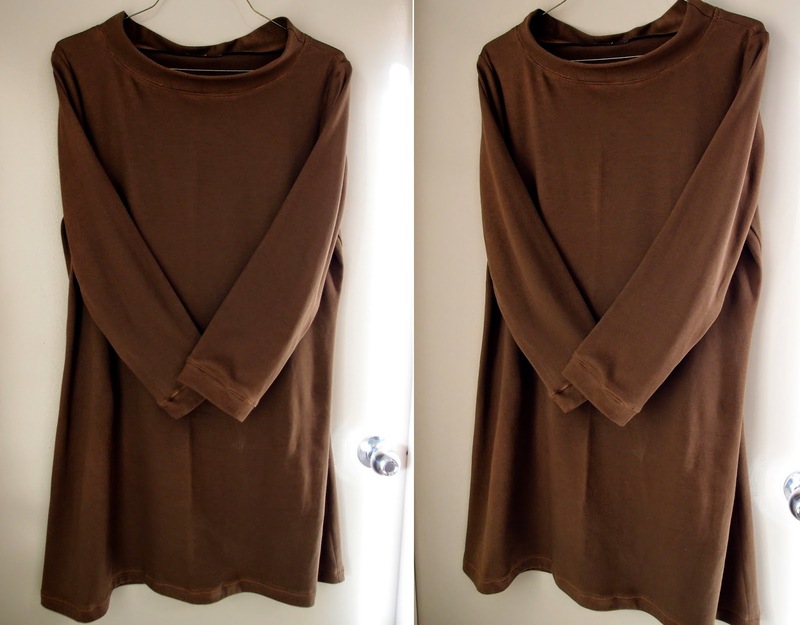 The colour is so ugly...best described as Baby Poo Brown...but it was easy to sew with (though my scissors didn't like cutting through two layers of ponti). Overall I like this pattern (though I hate my fabric). It's a simple make and good silhouette. Next time I'll forgo the funnel neck however as I think my bust works better with a more scooped out neckline which makes me look a bit smaller "up top". For this version I cut a straight size 7 and next time I'm going to go for the size 8 as it's a little snug across my chest and caboose. I'll keep the sleeves at the size 7 however as I think any bigger and they'll just be too baggy. I used a zigzag stitch to sew the majority of the seams on this dress, though I think my stitch was too big as it's not holding very firm...I can see the stitches pulling even as it's hanging on the coat hanger so I'm worried the dress is just going to fall apart if I wear it. The seam edges are finished with my old overlocker which only had three spazz-outs during this sewing session. I had a few issues trying to attach the funnel neck as for some reason I thought I should add interfacing to the funnel to make it nice and stiff. Good in theory (actually, dumb in theory as it felt like scuba wear) but the addition of the interfacing meant it was impossible to stretch the funnel onto the neck. But we got there in the end. It's not pretty, and the funnel is half the height it should be as I had to recut it and ran out of fabric. Please excuse the dodgy top-stitching! I was totally sober whilst sewing this. Honest. I'm pretty chuffed with my sleeve cuffs. I didn't follow Tilly's instructions for the cuffs as I was feeling lazy and I just wanted to get to bed. I totally winged it, but they worked out and look good. I feel quite proud of these cuffs...chuffed with my cuffs. I already have my next lot of fabric washed and it's hanging up to dry. Once I stick the new PDF together and cut it in my new size we'll be onto Coco...the second! Nice dress- you're rocking a bit of a Lt Uhuru style vibe there! The Coco is on my list of things I want to make, so I'm always interested in other people's versions. the brown is uninspired but I like the style on you, also these photos make you have such skinny legs! woo! Great work, this already looks great on, the minor alts will be great for comfort. Are you going to construct the next one totally on overlocker? Oops i need to get some more descriptive words! I've made my next Coco already (using that whacky sparkly ponti) and it was done with the sewing machine and old overlocker. I'm planning to make my first Lady Skater on the new machine though. Zoom zoom! Uninspired is such a good word..though I totally think ugly works too! I have super skinny legs up until my knees...then things go a bit whacky (hence my love of knee length garments)! ZOOM - good on you!